Pro-American immigration reformers are cheering the decision by Donald Trump’s team to renew its “hire American” labor policies amid their anger over the nomination of amnesty supporter Andrew Puzder to run the Department of Labor. “I’m just overjoyed to see” the renewed promise by Trump’s team to favor American workers, said Roy Beck, founder of the reform group, NumbersUSA. The announcement “reassured an awful lot of our members that the people at the top around Trump who believe in his commitment to American workers have a lot of sway,” he said. Beck says senators should now question Puzder in his nomination hearings about how he would help companies hire Americans workers at higher wages by raising the productivity of American workers. In contrast, amnesty advocates were mostly silent about Friday’s pro-American announcement by Trump. The announcement came Friday when Puzder promised to support Trump’s “Hire American and Buy American” immigration policy. That commitment came as some Trump supporters angrily protested Puzder’s record as restaurant CEO, where he said hiring-managers prefer immigrants to Americans, and where he backed President-Barack Obama’s 2013 cheap-labor-and-amnesty bill. My job as a business person is to maximize profits for my company, employees and shareholders. My job as the Secretary of Labor, if confirmed, is to serve U.S. citizen workers – that is my moral and constitutional duty. The public spoke loud and clear in this election, and delivered a mandate to protect American workers. It makes no economic sense to spend trillions on welfare and jobless benefits for out of work Americans while bringing in foreign workers to fill jobs in their place. As Secretary of Labor, I will fiercely defend American workers and implement my piece of the ten point plan the President-elect laid out. President-elect Trump’s plan to establish new immigration controls will boost wages and ensure that open jobs are offered to American workers first. Hire American and Buy American is our policy, and the one supported by voters in both parties. I will not provide guest worker visas to companies that break the rules, and will support reforms to raise wages for Americans — I know the system from the inside, and will be the best champion American workers have had. With 94 million Americans outside the labor force, and massive unemployment in our inner cities and among minority workers, my job will be to help these workers find jobs. We also have large unemployment in our immigrant communities, and these communities benefit the most from clamping down on guest worker programs that compete against them. Beck and Krikorian said the statement will allow Senators to grill Puzder on his plans to help Americans workers and raise their productivity. For a start, Krikorian said. Puzder should promise to tighten the process in which companies justify their requests to import temporary foreign workers, such as blue-collar H-2B visa workers. Companies should be forced to explain why they can’t find Americans who could be trained to do the work, and why they can’t get the job done by buying labor-saving technology built by Americans workers, he said. Prior to his nomination, while working at the CEO of two restaurant chains, Puzder argued that restaurant companies will automate their restaurants if federal or state officials impose excessive wage rules, such as a $15 an hour minimum wage. But the government can ensure that Americans use technology to become more productive and can simultaneously reduce job losses among Americans by lowering the annual inflow of foreign workers, said Krikorian. “We want to promote productivity increases, but the way we avoid large-scale loss of jobs [for Americans] is by adding fewer people from abroad to the [U.S.] labor market,” he said. Each year, 4 million Americans join the labor force to look for jobs — but the federal government also imports 1 million legal immigrants and roughly 1 million temporary foreign workers. Technology can help American restaurant workers, said Beck. “It is a legitimate thing as Secretary of Labor to be thinking about how to help people at the bottom of the labor ladder make more money — [that’s done] in the restaurant business by more automation and better management,” said Beck. For example, Beck said, Puzder can work with high schools and colleges to get more youths into skilled vocational training so they can build and maintain the labor-saving machinery, he said. 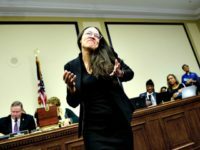 More Americans will be able to pay for college courses if education schedules are adjusted so the youths can work in extended summer tourism jobs that are now given to temporary foreign workers, he said. Puzder can also help young Americans by pushing companies to build factories and workplaces in the heartland states where too many young Americans lack jobs, said Beck. Amid the current federal policy of high immigration, companies “have not had good [business] reasons to go to Detroit or Memphis because they get all the legal and illegal workers arriving in the coastal states,” such as California, New York, Texas, Georgia or Florida, he said. 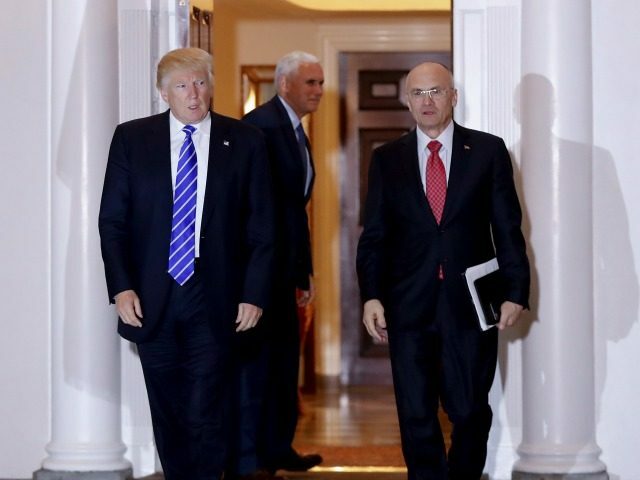 Puzder’s statement cited Trump’s overall vision and his ten-point plan for Americans’ wages, jobs and immigration.